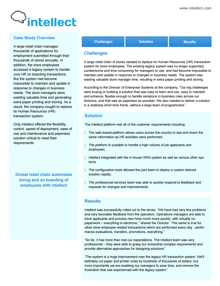 Challenges Circle K faced included replacing the Human Resources (HR) transaction system for store employees. The existing legacy system was cumbersome and time consuming for managers to use. Results after using Intellect resulted in Operations Managers being able to track applicants and process new hires much more quickly, with virtually no paperwork.